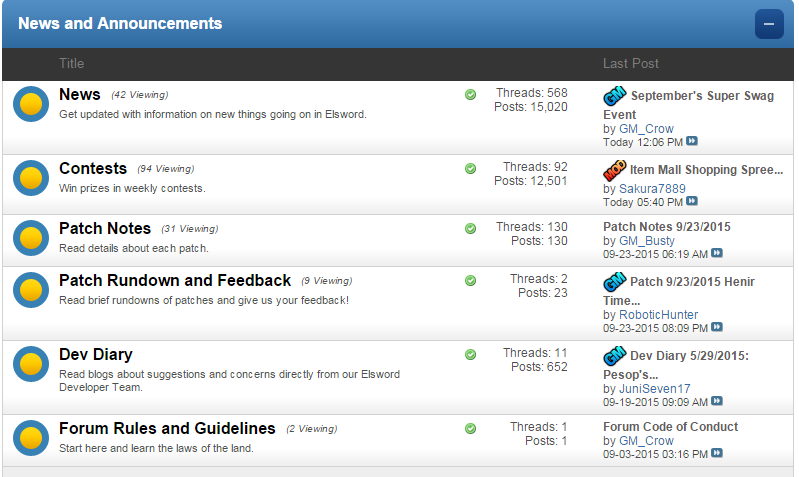 Welcome to the Elsword forums! Here in the Getting Started forum, you'll learn the basics and ins-and-outs of the forum with our Forum Tour Guide. This forum is where you and the rest of the Elsword community can discuss, share tips, exchange ideas and ask game-related questions. You'll find a variety of sections such as game information, places where you can submit your own ideas and creative art-forms, and even weekly contests where you can win prizes! Our Forum Moderator team is constantly here to supervise, enforce the Code of Conduct and keep these forums clean for your enjoyment. Patch information in great detail is posted in this section and you can even participate in weekly contests where you can earn prizes! Don't worry if you missed out on past contests, we always have new and different ones almost every week! Ever had a question about when certain items would stay in the item mall or when events would finish? Outside of the games main page you can find the answers here and even ask questions or leave feedback about these events. Talk about convenience! Now before we start asking questions, Why don't you try to introduce yourself here? It's always common courtesy to introduce ones self before entailing on a myriad of questions. You might meet some few friends along the way as well. Now we will explain the specific uses of each subsection so pay close attention and take notes! So what's a general discussion? As it's name implies, its essentially a section where "Phorumers" can discuss anything related to Elsword if its in regards to PvE, Items, Quests, NPCs and general tips and tricks! Are you a battle hardened veteran looking to stain your sword with the tears of your enemies? Or perhaps a young rookie looking to make his mark on Arena? Maybe you're an organizer wanting to host PvP events for the greater good of the community? Look no further than here! If you need to get an understanding of what and how skills/classes work in arena, this is probably the best place to ask. Here in the PvP section, you can inquire about how classes fare against others in arena, what are some of the best builds you can take, and even show some achievements that you may have acquired! You can show creative combo videos and other interesting discoveries you may have found as well. Got an item you don't need but you don't exactly want to sell it to an NPC? No worries! Just click the below! d. Understanding Suggestions and Feedback. Ever have an idea that you just wanted to share to everyone? Ever had an idea that you think that would improve the game or just have some general feedback? Look no further than here! Here you can provide ideas, suggestions, or even productive discussions on how to improve the game/community. You can peruse other threads and show your support for ideas you think are awesome as well! The Elsword Developer Team routinely browses these suggestions as a resource to help improve the game. So what if you wanted to talk about things not Elsword related? Maybe stuff about your day at work or asking people what their favorite anime is? We have an Off-Topic section for that specifically! We have a lot of user created games here such as "Give The Person Above You a Title" which is loads of fun! If you want to make friends by the lot, this is definitely the place to go. 4. Where to find help? It can be pretty intimidating as a new player in an MMORPG like Elsword. You may have a lot of questions that need to be answered and require guidance. Fortunately our community prides itself on making every bit of information about game features and characters readily available to those who need it. Thanks to the hardwork of our community members, we have tons of new player, game features, PVE & PVP, and character guides. There are some days where our computers like to be fickle with Elsword, creating problems with the functionality of the game. Other days, you might have issues with some in game actions like accepting quests or dealing with strange bugs. As you guessed it, we have a section for that as well! All in all, the forums are a extremely important resource for the player to not only be informed on current on-going events, character updates, and general discussion but also a resource to positively affect the game and its growth. It's a tool like any other that must be used responsibly in order to gain the most out of it. If you ever have any questions on whats okay and whats not, feel free to click View Forum Leaders to find a list of our Forum Moderator team. You can send these guys/girls a message with any questions you have about the forums; Better safe than never! With that said, We wish you the best on your journey through our forums!